Nollaig shona agus athbhliain faoi mhaise daoibh go leir. Scoil Niocláis will reopen on Monday 10th January 2011 - le cúnamh Dé. Wednesday 22nd December and Thursday 23rd December. Children will go home at their normal times on tomorrow Wednesday. Infants will be going home at 11.45a.m. on Thursday and the all the other pupils at 12 noon. Have a happy and peaceful Christmas. Nollaig shona daoibh go leir. Due to the recent bad weather, Scoil Niocláis will open at the later time of 10a.m. on tomorrow Tuesday to give pupils and staff a safer and better opportunity to get to school. One of our former pupils, Aoife Downey, was involved in a rare tragic accident in Frankfield last Saturday. We are deeply saddened by Aoife’s loss. Aoife was a full of energy, a wonderfully talented athlete and was always up for great fun. Our thoughts and prayers are with Aoife’s parents Sean and Siobhan, as well as Aoife’s sisters, Caoimhe and Eadaoin. The National Educational Psychological Service has been advising teachers in the school to help your child cope with this tragedy. It is possible that your child may have some feelings that he/she may like to discuss with you. It is helpful to listen to your child, be supportive of them and remain calm in what can be an upsetting situation. Maintaining the normal routine will also help your child. You can help your child by taking time to listen and encouraging them to express their feelings. It is important to give truthful information that is appropriate to their age. If you would like to discuss any matter pertaining the recent tragic events, you may contact me and/or the deputy principal, Sheelagh O’Leary at the school. Aoife will be lying in repose in the Church of the Incarnation, Frankfield on tomorrow Tuesday from 4.30p.m. until 6.30p.m. The funeral mass will take place on Wednesday at 11a.m. Scoil Nioclais will be open today. Use the church entrance where possible. If you feel it is unsafe to travel, stay at home. More later. Christmas Holidays: School closes on Thursday 23rd December at 12 noon. Scoil Niocláis will reopen on Monday 10th January 2011. Staff meeting: Thursday 20.1.11 - Children going home at 12 noon; Infants go home at 11.45a.m. Junior Infants - Thursday 16th December 12.30 - 1.20p.m. Senior Infants - Friday 17th December 12.30 - 1.20p.m. First Class - Monday 20th December 1.20 - 2.30p.m. 4th Class will be taking part in the Carol Concert on Sunday 19th December @ 7.00p.m. in the church. 4th Class will also be Carol singing, weather permitting, for charity at Ryan's Supervalu on Tuesday and Wednesday 21st and 22nd December between 12 noon and 1.30p.m. School open. Text-a-parent not working at the moment. Scoil Niocláis is open today. Icy footpaths near the school. Take care. Scoil Niocláis is open today. Scoil Niocláis will open again today 2nd November. Main roads are fine. Be careful on the secondary roads, estates and footpaths. There will be an update during the day regarding opening tomorrow. Scoil Niocláis December 1 - 8a.m. Scoil Niocláis will open today. However, Bellevue Rd very icy. If you can, walk to school. Use church yard entrance. What is involved? The Stay Safe programme is a primary school based approach to the prevention of child abuse. Parental involvement is an essential part of the Stay Safe programme. The main aim of this meeting is to outline how parents can improve their child's learning outcomes by involving themselves in the programme through discussing the topics as they arise with their child. Parents are provided with information on child abuse and bullying, the content of the Stay Safe classroom lessons and the key messages for children. See www.staysafe.ie for more information and for English, Irish, Chinese, French, Lithuanian, Latvian, Polish and Spanish language versions of the parent booklet, Stay Safe: A Parent's Guide. Staff meeting on Thursday next 21.10.10. Infants going home at 11.45a.m. All other at 12 noon. Cork Footballers cancelled ... for the moment. They shall return! Parent Teacher Meetings 16th and 17th November. Ranganna 1 to 6 will be going home at 2.05p.m. on both days. On Wednesday 20.10.10, there will be a tennis demonstration by our resident tennis coach, Conor Twomey in the school hall @ 2.30p.m. Conor has been coaching tennis in the school since 2006. The course's primary goals are participation, fun and an enthusiatic approach of developing young athletes. 40 minute classes for 6 weeks - €55. Max number in class - 10 and 2 coaches present. All rackets and equipment provided. We urge people to drive carefully when dropping children to or picking children up from school. Please take note of the safety signs, do not drive beyond the safety cones, park wisely and always expect the unexpected. Parents are asked not to park in the Church Car Park nearest the school. This is reserved for School staff . We ask this of parents in the interest of safety of all our children. Junior and Senior Infants will be going home at 11.45a.m. on Thursday 21st October to facilitate a staff meeting. All other classes will be going home at 12 noon. 2010 is the Year of the Birch Tree. Teachers, students and parents can find out more about the birch tree and National Tree Day by logging on to www.treecouncil.ie. There will also be a tree display on the ground floor of Scoil Niocláis in the next couple of days. The annual general meeting of the Scoil Niocláis Parents Association will take place in Halla Niocláis on Tuesday 12th October @ 8p.m. A new committee for 2010-2011 will be elected on the night. If you are interested in helping out with school activities, please come along the on the night. The SNPA welcome all new volunteers. The Annual Fundraising School Walk takes place on Wednesday 6th October weather permitting. The Walk is organised by the ever hard-working Scoil Niocláis Parents Association. The walk meanders its way around the parks and estates close to the school. All proceeds go into the SNPA coffers which has over the years resourced the school with computers, sports equipment, classroom resources, musical equipment etc.. Just pray for good weather! Here are some achievements and activities that the pupils in Scoil Nioclais have been involved in this term. Well done to all! We are learning to eat better, stay healthy and get 5 a day. As part of this programme we are growing our own fruit and vegetables. We are taking good care of our potatoes, carrots, spinach, lettuce and strawberries. They are coming along nicely. 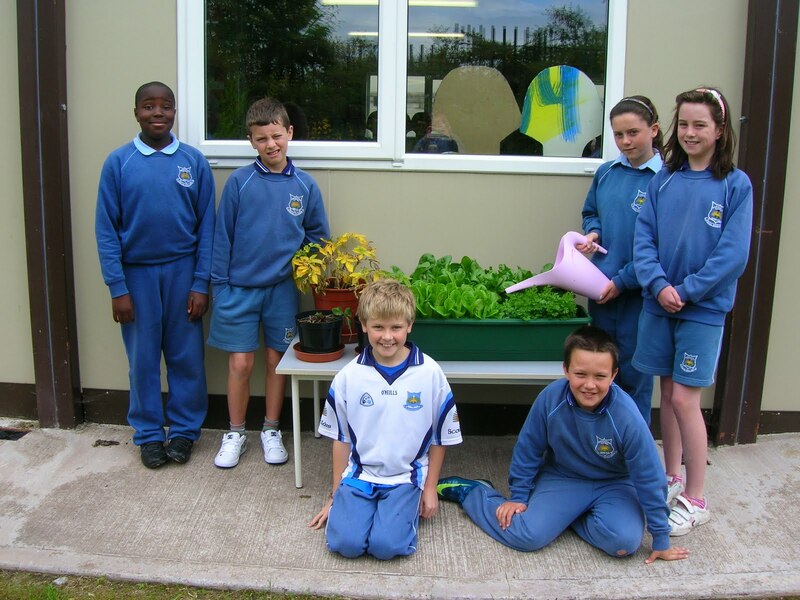 Memories of fourth class by Ms. O’Mahony’s class. My favourite memory in 4th class is when I was playing in the basketball tournament, winning all the matches and bringing the cup back to school for a second time. One of my memories is when we made our own hats and then we had a fashion show. That was great fun. One of the best memories that I have would probably be the Japanese workshop. I liked it because we learned lots about Japan and I liked learning about the Japanese culture. I also liked the Roman project because I learned new things about the Romans that I never knew before. It was very enjoyable. When we were doing our Roman project these men came into the halla dressed in Roman clothing and told us all about life in Ancient Rome. by me! My happiest memory was when we were drawing our friend’s faces. I was drawing my friend and it was so bad because you were not allowed to lift the pencil off the page and you were not allowed to rub your mistakes out! One of my favourite memories was doing The Romans. I loved all the art. it was my favourite project. We learned so much about them. I never knew three new students would come this year. They are all really nice. Their names are Alex, Ucha and Georgia, Ucha’s English is very good because he is not from Ireland. My best memory of 4th class was learning about Japan. It was sooooo fun. I also learned a lot as well as playing a few games and doing art! I also enjoyed our games of dodge frisbee. It was a laugh. The funniest moment was when my friend Ucha lifted Jamie up when my teacher asked what did he do. One of my best memories of 4th class was making the Philip Tracey hats. I loved mine because I put a lot of hard work into it. They were the best art this year. I also loved the Xmas Factor when the teachers dressed up as High school Musical. I loved the Japanese work shop. It was really good. I loved all the different lessons. I though it was superb, and the best Geography all year long. I also loved the Roman project. It was excellent. I loved it because we did different topics each. I really loved my fourth class memories. The funniest moment was when Cian was doing pastels and got them all over his face. The best moment in 4th class was walking into a new class and meeting new friends and a brilliant new teacher. It was wonderful. My memory was when I found out a teacher from my old school works here in Scoil Nioclais and every day I come in school I can see her and say hello. Every Tuesday a very artistic woman called Chika comes in and teaches us Japanese things. The best things she did with me and the class was probably the Japanese writing. It was so wonderful and DIFFICULT but we got there. My best memory of 4th class was when we found out there was a girl called Chika coming to us. Chika was from Japan. She came to teach us Japanese which is the most fun and enjoyable subject EVER! But yet there still are other memories about 4th class yet to come so hang on in there! I thoroughly enjoyed the Cork Pops which was in the City Hall. I had been there before but each time I went there was either a different song, different people but there was always something different! by me! The highlight of being in fourth class was making the centre pieces for Christmas. I liked them because they were so beautiful on the kitchen table. the year. My favourite project was about the Romans because it was so interesting learning more facts than I knew already. I was disappointed to see Chika go because after the eight weeks we had, I wish she could have stayed longer. My favourite memory from fourth class was when we mae hats because it was fun writing the commentaries and doing the catwalk to the cool music. I also loved making the Christmas centre pieces with the pretty flowers. The Santa and the candle also made them more unique. They were all beautiful and looked gorgeous on the kitchen table. Another one of my best memories was when Ms O’Mahony told me that I had a gift for writing stories. My favourite memory is Ms O’Mahony and Chika too. Its fun when they teach us for me and for you. Dodge Frisbee is fun too, trying to dodge the things ye throw. It was fun drawing portraits without lifting the pencil. The faces I drew were funny, how about you? It is fun reading “Holes” and CAPER books too, I hope we finish it how about you? The Roman history and Egypt too, I bet you wish you were doing it too. When someone says “I’m done” Ms O’Mahony says “finished” that’s the way she is, trying to get us to speak proper English! by me! I loved the Romans because the culture, games and war were interesting. I like the gladiators and the chariot racing. They were brilliant. It was so much fun. It was really interesting where they lived and what they ate!!! When the Romans came we had a lot of fun. And the marbling with acrylic oil paints was awesome. We also did Paul Cezanne style still life pictures. Ms O Mahony always has something fun to do in art!!! I thought that when we played dodge Frisbee for P.E. it was awesome because I liked playing it with my friends. But the best was when we had Japanese culture lessons with Chika Ueda we made lovely origami, koinobori (wishing carp) and beautiful Daruma Dolls. I loved doing the Italian project because I love learning about other countries and the people in them. The surprising memory this year was when I found out that there were three new children in my class, because I never would have expected that to happen. The Japanese workshop was the happy memory because I enjoyed learning and making things from Japan. The funny memory this year was when my teacher overheard my friend and I talking about our favourite teacher!! by me! I have a lot of memories about fourth class but my favourite memory was the first day of school and three new people joined our class group. We made great friends with each other. My funniest memory I have is when Dave Scott told the class really funny jokes. He is one funny friend and his jokes were always hilarious. The other good memories of 4th class are the roman project, the energy project and I think it will be our school tour. I really enjoyed my time in 4th class and I hope 5th class will just as good! On Wednesday 21st April, 6th Class in Scoil Niocláis made their Confirmation. We were very lucky with the weather, for on that day the sun was shining down on us. When we reached the church everyone was in their new clothes and they looked lovely. We were honoured to have Bishop Buckley celebrating the mass and confirming us on our special day. The ceremony was lovely and very prayerful. It was made even more special with our family and friends around us. The 5th and 6th choir also sang beautifully and all of our preparation and practice really showed. After the mass some people went to restaurants and had parties with their families who might have travelled a lot to come and celebrate our day with us. All together the day was a great success and on behalf on all of 6th class we would like to give a big thank you to all the teachers involved! Under the Sea in Third Class! The three third classes held a Science Day in the halla to show 1st and 2nd class and their parents the exciting experiments they have been doing as part of the Discover Primary Science programme. Experiments on the day included balloon rockets, dancing raisins, paper helicopters, fingerprints and more. Well done to all the budding scientists in third class! 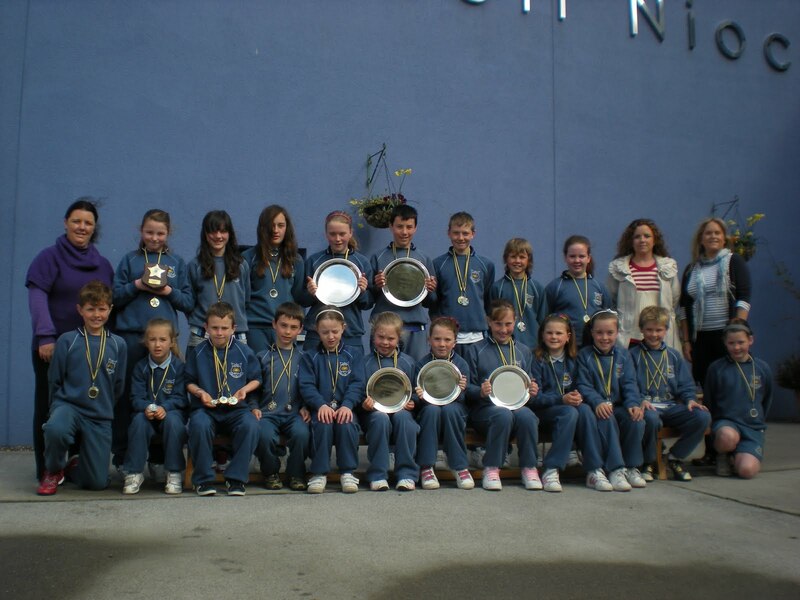 Scoil Niocláis Swept The Boards at the Swimming Gala!! Well done to all the pupils who took part in the Northside Swimming Gala in March! Twenty students from first class to sixth class did Scoil Niocláis proud at the swimming gala. Each student won a medal, with many taking home two or three medals, ranging from bronze to gold. Children took part from five different schools from Cork. The children opened the gala by parading around the pool, school flag held high and finishing with the National Anthem. A win in the very first race of the gala got us off to a great start. It got better and better from there, with every swimmer doing their very best and reaping the rewards for their great efforts. Plates were awarded for winning Sections A,B and C of the event, the children achieved first place in the relays and to top it off their effort as a team was awarded by adding up all the points gained throughout the day and they were presented with the much sought after Overall Winners Plate!! The under 8s and under 9s did really well in what was their first Gala for some, to achieve the positions they did in the races and gain the very important points to achieve this Overall Awrad. So a special thanks to them. A very special thank you also to Fiona O’Callaghan who managed the team so well on the day and during preparations. Thank also to Ms. Hipwell for all her help on the day of the gala. Well done again to all the swimmers who took part for their excellent behaviour and speedy swimming!! Well done to our fourth class boys and girls who took part in the Father Matthew basketball blitz last week. Both teams played really well with our girls winning out the overall competition. Thank you to Mr Moynihan and Paula Duggan for all their work in coaching and preparing the teams. Well done to all – you did Scoil Niocláis proud! Fun on the farm for Junior Infants! At the end of April, we went to admire our beautiful daffodils. We planted these ourselves earlier this year. We really enjoyed our first annual Sports Day. We had a wonderful time playing the different games together! The mobile Farm came to visit in May. We had a great time looking at and holding the different farm animals. Our favourites were the baby chicks and the rabbits. During the beautiful weather in May, we even took our Art lessons outside. We drew great pictures of our school in the sunshine. Japan comes to Scoil Nioclais!! Fourth classes are taking part in an eight week programme featuring classes in Japanese culture, origami, traditional arts and crafts and brush calligraphy offered by Triskel arts Centre, cork. Fourth class followed an 8 week course in Japanese art, origami, culture and language, given by Chika Ueda from the Triskel Arts Centre. We loved learning about Japan and all of the art activities. See a selection of photographs from NB7 showing the daruma dolls and hina dolls we made, along with our beautiful calligraphy. Arigatou Chika! In the Japanese workshop we made daruma dolls. We had a terrific time making them. It is traditional to make a wish while making the doll. It is also traditional to put one eye on but I decided to put two on mine. 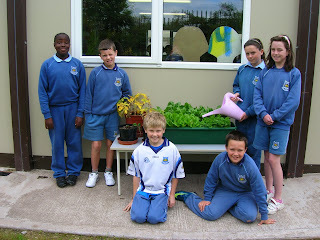 3rd Class in the garden! We have been really busy over the last few weeks as our tomatoes; peas and basil have all been growing really well. The recent spell of good weather has resulted in great growing conditions and we expect to have a bumper crop of vegetables and herbs this year. Ahhhhh ! King Tut has awakened! Ancient Egypt has returned to Ms. O’Mahony’s 4th class, We have made these gorgeous masks from plaster of paris and painted them with royal blue and a shimmering gold on a background of cardboard. They’re so amazing, they really do look like King Tut’s death mask! I feel like a pharaoh! We made probably the coolest masks ever! My mask was legendary! We first covered the mask in Vaseline and stuck plaster of paris on. Then we put a backing on. We painted it in metallic gold and royal blue and we were finished. 2nd Class Ms. O' Sullivan! They cannot talk back ! The Scoil Niocláis website displays children’s work, tells of some their school experiences and keeps parents and friends informed. IT IS NOT AN INTERACTIVE WEBSITE. Children cannot put information on the website. Children cannot email from the school website. Teachers are the only people who are permitted to put information up on the school website. Well done to all those teachers who use the school website to parade, display and showcase the talents of the pupils in Scoil Niocláis. A special mention for the webmistress, Ms. Mary Walsh and one of our parents, Mr. Brian O’Flaherty who were the initial driving force behind this initiative. As you are well aware, fund-raising for our school has been ongoing for a number of years. We would like to inform you that due to your continued support over these years, we have been able to clear our initial debt. Now that we are in more difficult times, we appreciate it is going to be hard for parents to continue in this vein. With the building of our extension almost ready to commence we would ask parents to where possible, continue supporting our fund-raising efforts in any way they can. Mile buiochas also to the members of the Scoil Nioclais Parents Association for all their hard work during the year in supporting the school in many different ways. It is much appreciated. Once again, on behalf of the Board of Management of Scoil Nioclais, we thank you for your support in the past and look forward to your continued support in the future. A sincere thank you to the parents who have offered to help out with our Intercultural Celebration. In order to add to the colour and atmosphere of the day, all children are invited to wear clothes that represent either their own or another country. The more creative the better! Why not make your own costume using the colours of a particular country's flag? We look forward to seeing your efforts, and who knows, there may be a few prizes for original costumes!! One of our great traditions here at Scoil Nioclais is our annual Intercultural day where students can both learn and explain different aspects of other cultures. -Story telling, translations and much more. We would be delighted to hear from parents who would like to bring a little of their native country to Scoil Nioclais and would welcome any ideas you have. Help us keep this wonderful tradition going by contacting Orla (SNPA), through the school office or Rosemary in Room 18. Laura's of Douglas are suppliers of the Scoil Nioclais School Uniform and are having a 3 day promotion event from Tuesday 8th until Thursday 10th of June. There is 10% off the School Uniform or alternatively you can avail of one of our promotional packs available on these days. The next staff meeting will be held on Friday 30th April. Infants will be going home early at 12.15p.m. and the remainder of the pupils will be going home at 12.30p.m. The Department of Education and Skills(!) has sanctioned the building of 16 room extension to Scoil Niocláis, Frankfield. Reddy O’Riordan Staehli, Douglas, Cork are the architects for the project. While the project will be progressing to tender in the near future, no start date for construction has been named as yet. Nevertheless, the Board of Management of Scoil Niocláis intends to keep the the local community up to date with developments by communicating regularly through the Scoil Niocláis Parents Associations, through the local residents associations and the school website. When the construction date is announced, it is the intention of the Board of Management to call a meeting in the school hall to outline the strategies that will be put in place to combat the disruption to the community, particularly at opening and closing times. All interested parties will be invited to the meeting. One suggestion is to form “walking buses” from different areas of the parish i.e. groups of children from the same park/area walking to school together under the supervision of the parents. Representatives from the board of management, the county council, the gardai and the design team will be on hand to answer questions. Access to the school from the church yard will be suspended during the construction period. This access will open again once the building has been completed. At present, there are two entrances to the school from the Bellevue Road. A third temporary access point will be opened up on the Cooney’s Lane side of the school ground. This will be only used as an emergency access once construction is completed. The extension to the school is a welcome development which will further strengthen the whole community of Frankfield/Grange. I’m sure that with discussion and cooperation we will overcome any difficulties that may arise. Bhí lá iontach ag na páistí ag an gCéilí Mór i rith seachtain na Gaeilge. Bhain siad an-thaitneamh as an rince. Buiochas agus comhghairdeas mor ag dul chuig Niamh Marie agus Cáit Ní Chonchúr a eagraigh an ceili. Scoil Niocláis will on close on Thursday March 17th and Friday March 18th. School closes Thursday June 30th for the summer holidays. All Lotto tickets to be returned for the opening draw next week. Scoil Nioclais will close at 12 noon on Friday 26th March for the Easter holidays and reopen on Monday 12 April. Scoil Nioclais will remain closed on Friday 12th March to facilitate a curriculum planning day. The Draw itself, based on the National Lottery numbers, will start on Wednesday St. Patrick’s Day 17th March and last for 5 weeks(10 draws), ending on Saturday 17th April. Each contestant chooses six numbers The person with the most points wins €1000. Second place wins €300. Least amount of points wins €100. All tickets should be brought to the school office on or before Friday 12th March. Each school family will get a set of tickets to sell. Tickets are also available from the school office. “ Scoil Niocláis had benefited hugely from the generosity and help of parents and friends in Grange/ Frankfield. We would like to thank all those who have supported our cause to date and wish everyone luck in this year’s Lotto Draw.”. said Mr. Robert Oldham, Scoil Niocláis Lotto Organiser. Fr. John Walsh , Chairperson of the Board of Management said: “ We hope that construction on the new 16 classroom extension will go ahead before the end of the year. The funds generated from the Scoil Niocláis Lotto will furnish the school with the resources essential for a modern primary school. Second class will be making their First Confession on Wednesday 3rd March at 7.30 in the Church of the Incarnation, Frankfield. Catholic Schools Week gives us the opportunity to acknowledge and celebrate the contribution that our Catholic primary and post-primary schools make not just to Irish society, but to the mission of the Church. Last year marked a very successful beginning of an all-Ireland celebration of Catholic Schools Week and we hope this year to build on that foundation and continue to create a space where we can proudly articulate and celebrate our ethos and identity. This year the theme for the week is ‘Catholic Schools – A Light for Every Generation’. This theme reminds us that we are constantly challenged to let that light shine for the present generation and this will remain part of our task for future generations. It also allows us to remember with great gratitude all those who contribute through their work in establishing schools and places of education. Monday 1st February La Fheile Bride: St. Brigid’s Day - School Assembly - Fr. John Walsh PP. Wednesday 3rd February - Prayer Service to celebrate Grandparents Day – Feast of St. Blaise - Fr. Colin Doocey CC. Friday 5th February : Mass with Communion and Confirmation Classes. Grandparents and parents are also invited. A small altar will be erected in the foyer of the school to remind us of St. Brigid – Murie na nGael. A special petitions box will be available for requests, prayers and petitions. A representative selection will be read out at Mass on Friday. Camogie Success for Scoil Niocláis!!! A fantastic year of sporting success for Scoil Niocláis was added to by our 5th class camogie team, who won their division in Blackrock GAA Monday 25th of January. The girls played fantastic all the way through and won out an epic final game on a scoreline of 1 goal to nil! The girls were led by a fantastic coaching staff of Miss Sheila Holland and Miss Leslie Horgan, thanks also to all the parents who helped out on the day. Everyone in Scoil Nioclais are so proud of you all, well done and good luck in the finals!! All parent-teacher meetings will be held on Wednesday 10th and Thursday 11th of February. Children will be going home at 11:oo a.m. for infants and 11.15 a.m. for all other classes on those dates. Raffle Tickets on Sale Tomorrow! Sixth class are organising a raffle this Friday to raise money for the Haitian disaster. Tickets for the raffle will cost €1 for one strip or €3 for five strips and will be sold on Thursday. The prize for these raffles will be delicious, tasty, large cakes!!! Hopefully we will raise a good bit of money to donate to Concern's Haiti appeal. Green Schools Slogan Competition On Saving Energy! Write your slogan on a piece of paper. On the back write your name, your class, room number and teacher's name. Submit it to your teacher by Friday the 29th of January.e.g. "Be bright, turn off the light"
Prize is a Smyths voucher. The sixth classes are organising a cake sale in Scoil Niocláis this Friday for the people of Haiti. They will be going around to classes to sell them. Pupils will be going home early on Friday 22nd of January due to a school staff meeting. School will re-open tomorrow Wednesday 13th of January at the usual time. Scoil Nioclais will be closed by ministerial order until Thursday 14th. Any changes will be posted.